This news will surprise no one who has discovered the joy that is setting off to work on two wheels, but new research out of Portland State University found that people who bike to work enjoy their commutes the most. People who walk to work are close behind on the commute satisfaction scale. I met Oliver Smith, a Ph.D. Candidate in Urban Studies at the Nohad A. Toulan School of Urban Studies and Planning at PSU. Smith recently completed a research project titled, Commute Well-being Among Bicycle, Transit, and Car Users in Portland, Oregon (PDF of presentation poster) Based on surveys from 828 people taken during January through February of 2012, he found that commuting to work under your own power “increases commute well-being.” In other words, the happiest commuters are those who walk and bike. 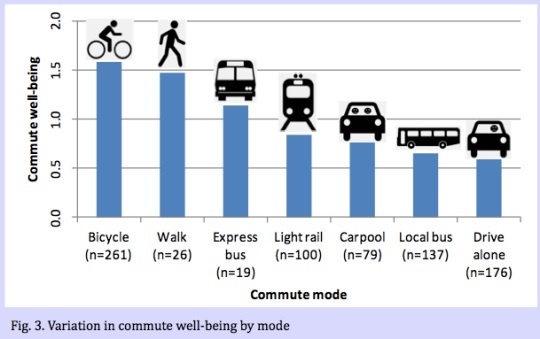 Of course I was happy to see that of all modes surveyed, biking made people the happiest (see chart). The lowest measures of commute well-being were recorded by people who drove alone (which is unfortunate because 58% of Portland commuters get to work that way). Elsewhere on the Network today: The League of American Bicyclists reports that Atlanta is gearing up to establish itself as a bike-friendly city. Car Free Baltimore shares a list of ideas for making the city more livable in the short term. And Urban Review STL explains why St. Louis needs true high-speed rail to Chicago. A robust study of British workers found that people who commute by bike are less likely to die from heart disease, cancer, and other causes.